Jerusalem’s Hadassah Medical Center has, for the first time in the world, repaired fractured bones by harnessing adult stem cells and platelets from their patients’ blood and bone marrow and injecting them at the fracture site. The bones, report Prof. Meir Liebergall, head of Hadassah’s Orthopedic Department, and Prof. Eithan Galun, head of Hadassah’s Goldyne Savad Institute of Gene Therapy, healed in a quarter to a third of the time it usually takes with traditional methods. In addition, the Hadassah team repaired some breaks that would not heal at all without this bone marrow transplant. 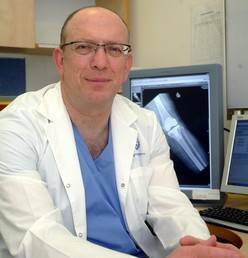 While the Hadassah team began the preliminary work on this technique a decade ago, the physicians have now performed the procedure successfully on seven patients with broken tibias (the inner bone of the lower leg), aged 18 to 60. Instead of taking the traditional six to nine months to heal, the fractures treated with adult stem cells and platelets healed in two months. Young Hadassah International chose Prof. Liebergall’s research as its fundraising project for 2005-2006, raising $88,000 toward this work in advanced trauma treatment. Prof. Liebergall notes that although in principle any type of fracture that typically takes six to nine months to heal or doesn’t heal at all can be treated with the technique, the therapy is most suited for high-impact fractures, resulting from sports injuries or accidents. The technique, performed either under regional or general anesthesia, involves removing 50 milliliters of mesenchymal bone marrow cells and 100 milliliters of blood from the hip area. The adult stem cells can differentiate into bone cells and, once processed in the lab, be injected into the fracture site to repair the bone. David Bonnen, who slipped on some stairs while out for a walk with his dog, underwent the new treatment three months ago to repair the complicated fracture in his leg. The Hadassah team plans to monitor patients for a year before regarding their therapy as a complete success.